You can check out the time schedule, course records and maps for all the races below. Along with all the fine high school runners, you can also check out some of the future stars in the section in the middle school races which will begin promptly at 8am. After all the middle school/high school races and all the dust has settled, the coaches and any adults brave enough to take on the 2 mile course can compete in the Open/Coaches race at 12pm. 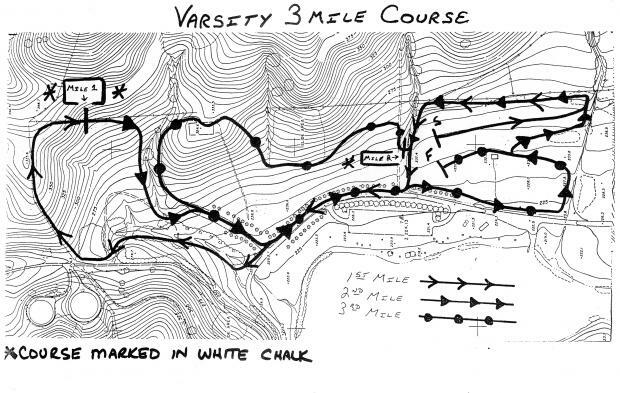 The varsity 3.0 mile course itself is quite challenging and has two hills that are affectionally known as "big mama" and "little sister". The majority of the course is mostly dirt with a very small portion run on pavement. What makes the course difficult is that the downhill that follows "big mama" is quite steep and you can't really get rolling until it starts to flatten out. 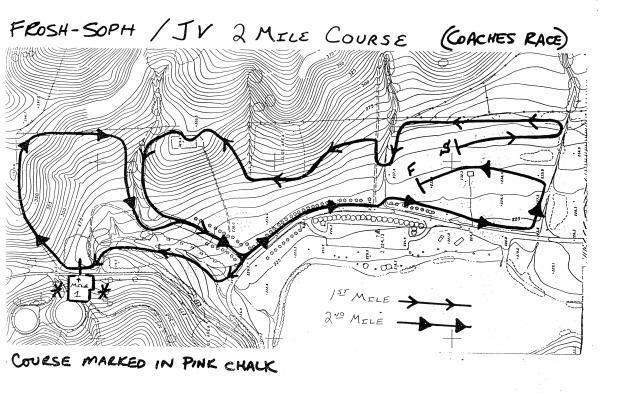 You can check out the awesome maps of the course thanks to Jesuit coach, Walt Lange. 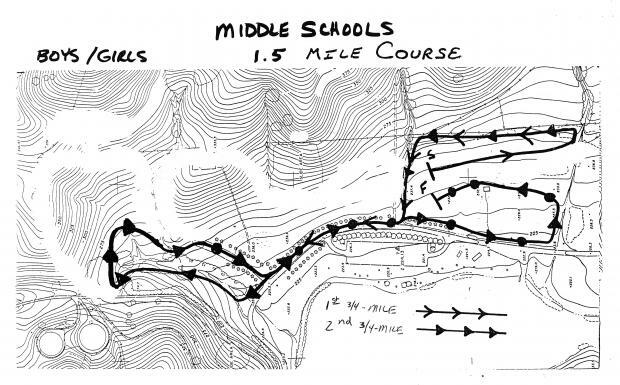 The 2 mile course, although obviously shorter, has two hills back to back. The girls' varsity race will feature the Davis girls (Maggie McManis photo above) who recorded perhaps the finest all-time season for any SJS girls team in 2015. With a less than fully healthy, lead runner, Fiona O'Keeffe, Davis put a major scare into the 3-time defending Division I state champions Great Oak at the California State Meet but came up just 2 points short 44-46. 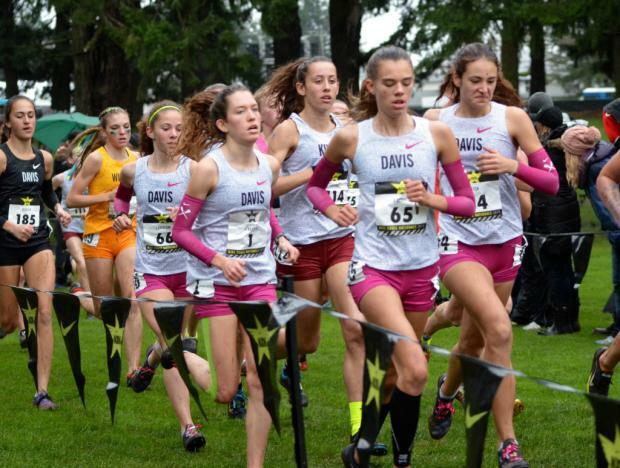 However, a week later, Davis was able to get past Great Oak at NXN to finish 2nd behind XC juggernaut Fayettiville Manlius. While O'Keeffe will be taking her talents to Stanford University, Davis will be well stocked as another O'Keeffe (Olivia) and senior Sofia Castiglioni lead the way for the Blue Devils. The Bella Vista girls have also made waves at the section and state levels over the past few seasons will not be joining their boys' team. A senior laden BV team won the SJS Division II race last season and finished 2nd in state in the Division II final behind 9-time state champion Saugus. A team to watch out for is the host Vacaville Bulldogs. They are led by sophomores Gabriela Hernandez and Jaxin Woodward (sister Jurnee was state 300m hurdle champion). The boys' course record will definitely be in jeopardy as course record holder Michael Vernau (above leading CA state 3200m. final) returns to defend his title. Vernau is ranked in the top 10 nationally after a breakthrough 2015 cross country season and 8:54.58 3200m. personal record on the track. 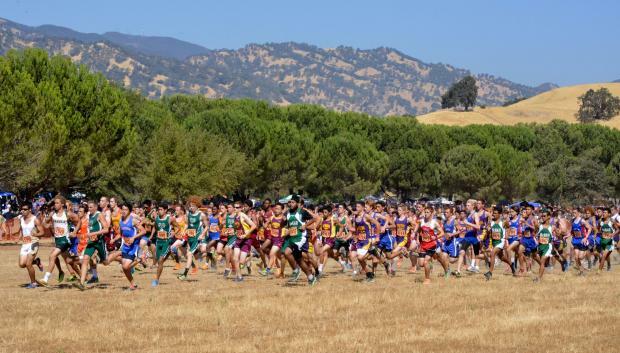 He will be tested by fellow SJS runner, Luis Grijalva of Armijo who had his own sub 9 minute effort with an 8:59.98 personal record at the Dublin Distance Fiesta. If the weather cooperates and it should as the varsity boys will run early enough in the day to challenge Vernau's 15:20 from last year and potentially establish a new course record that might be around for a long time. 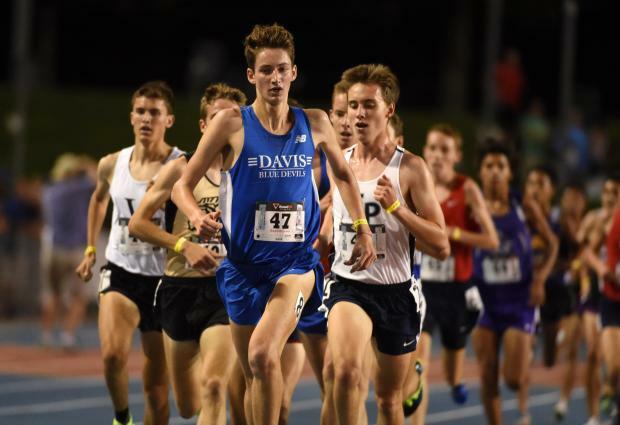 The teams competing this Saturday are linked to this article and some of the best include the Jesuit boys who finished a very respectable 3rd at last year's state Division I final behind two of the top teams in the nation, Great Oak and Dana Hills. They return a formidable duo up front with Ben Holland and Brendan Jones. The Bella Vista boys won the SJS Division II title last year with a young team and will be a contender once again this season. Bob King will once again lead his Del Campo team and their distinct uniforms will more than likely be racing near the front in every race.